As I'm sure you'll have gathered by now, the girls and I all absolutely love reading at home. Our bookshelves are overflowing with treasured classics and newer, quirky titles and we are equally fond of fact as we are fiction. The bedtime routine has always been a pretty special one to me. Even when the girls were tiny babies I'd read to them after they'd had a bath and I'd got them into their pyjamas. Snuggling down, closing your eyes and listening to a story is such a lovely way to relax and unwind at the end of a long day. These days the girls will often read together and it's probably the only time of day they aren't either fighting or ignoring each other so I love it even more! Now that she's nine, Daisy is quite happy reading to herself in the evenings, although we do still have joint family reading time occasionally. Evie, at six, still likes a bedtime story - and very often one will turn into two and then she'll ask for a third.... I know she'd happily have me keep reading until she fell asleep if she could! 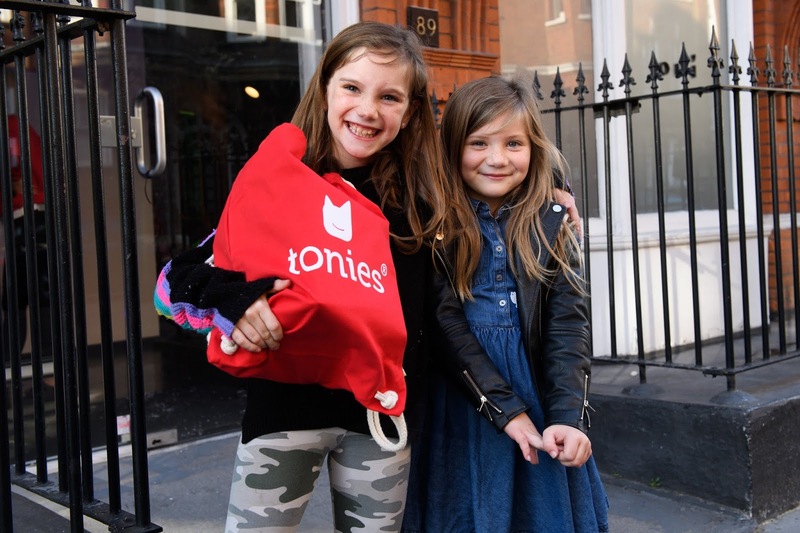 I was rather intrigued when the girls and I were invited to the London launch of the critically acclaimed children's audio system, tonies®, last weekend. These little audio boxes are magical story tellers and I couldn't wait to try them out. Already a huge hit in Europe, tonies® have finally hit the UK and Ireland - just in time for Christmas! 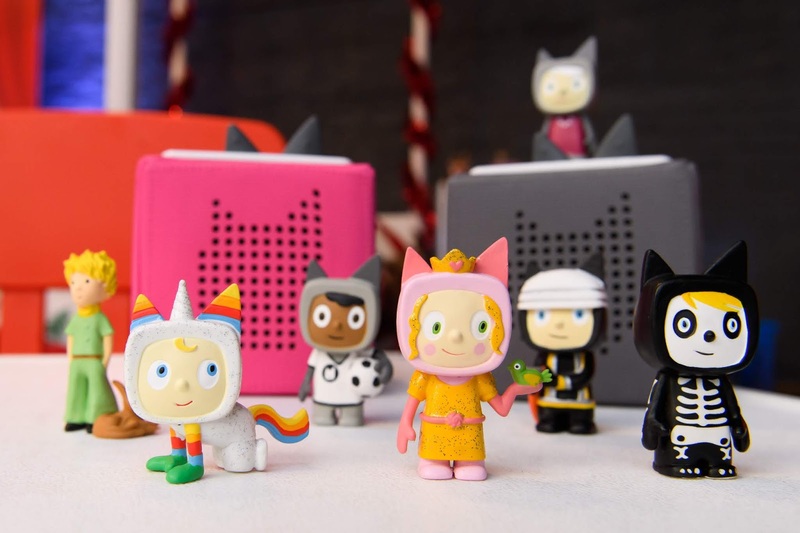 Combining an audio player with collectible figurines, tonies® gives story telling a whole new lease of life. The toniebox is super easy to use so it's perfect for kids of all ages, and they are available in several colours so there's one to suit every taste! It's portable and comes with a charging base, and each full charge gives seven hours of playback. When you buy your toniebox, it comes with a creative tonie that you can add up to 90 minutes of your own audio to via an app. How brilliant is that? I've recorded myself reading the girls some of our favourite made up bedtime stories and have also recorded messages to them from my phone when I've been out and about. Not only does this solve the 'please can I have an eighth story, Mummy' dilemma every evening, it also means you can still say goodnight if you happen to miss bedtime for any reason! As well as the creative tonies®, you can also buy individual pre-recorded tonies® which play all your favourite classics, like Stick Man and Little Red Riding Hood, as well others that are loaded with songs and lullabies. Plus you can download your own music onto them which is great for older kids. They work by placing the tonie on top of the box to start the content playing and removing it to stop. Simple as that. They are also magnetic so if the box gets knocked, the story won't be disrupted! The volume is controlled by the 'ears', and you can skip/rewind a track by tapping the side of the box. Genius. 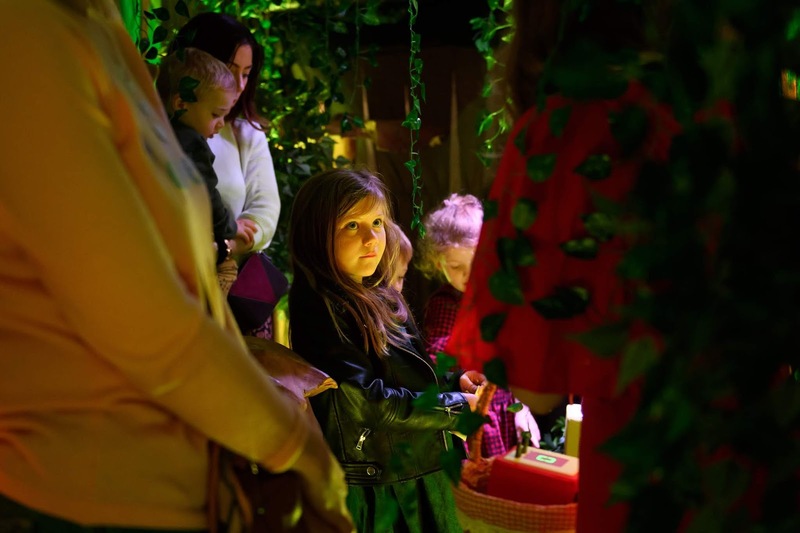 At the event we were whisked away to a Christmas storyland and the children were taught how the tonie boxes work by Little Red Riding Hood and James from The Snowman before getting to try them for themselves. They had heaps of fun - it turns out the figurines are just as fun to play with as they are great for telling stories. There are dozens to choose from and we will definitely be starting a little collection! The boxes cost £79.95 (available from Amazon) and prices for the tonie characters themselves start at £11.99 - I can't wait to get the girls some for Christmas, they're going to make perfect stocking fillers! 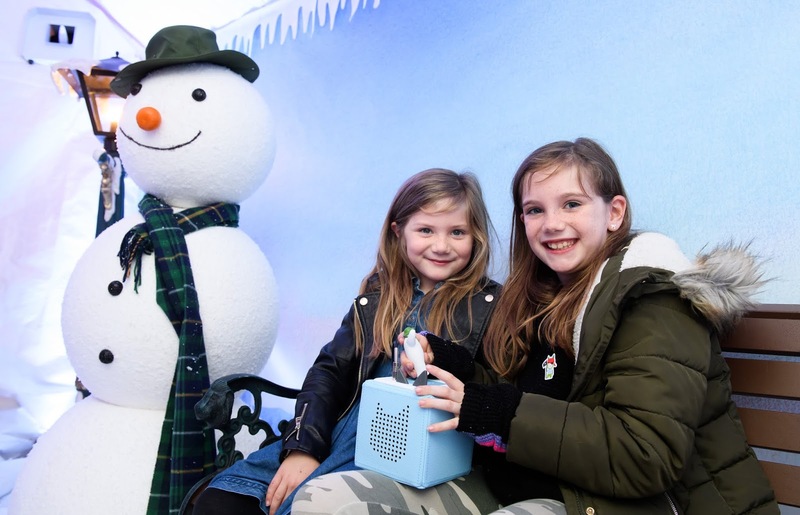 This is not a sponsored post, however the girls were very kindly gifted a tonie box each at the event.